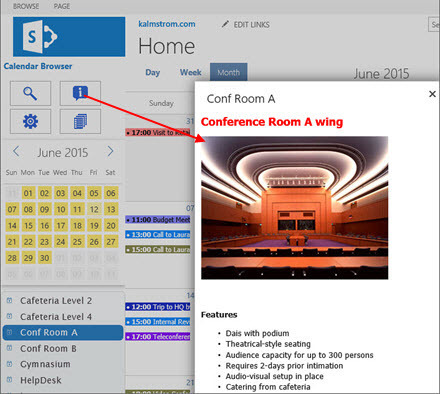 In Calendar Browser for SharePoint resources are stored in SharePoint calendars, and users book the resources by creating an event in the calendar of the resource they want to use. Users search resources, see descriptions of them and book directly ‒ all in the same SharePoint page. Let all employees search among the resources and book what they need, or let a reception or booking service use Calendar Browser. Or have a combination of both! 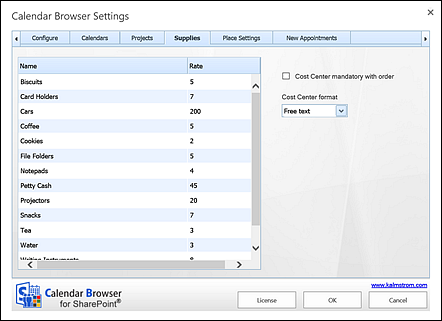 Calendar Browser is fully integrated in SharePoint. To the left on the Calendar Browser page in SharePoint you can see links to all the resource calendars. Select one of them, and the bookings in this calendar will be shown to the right. 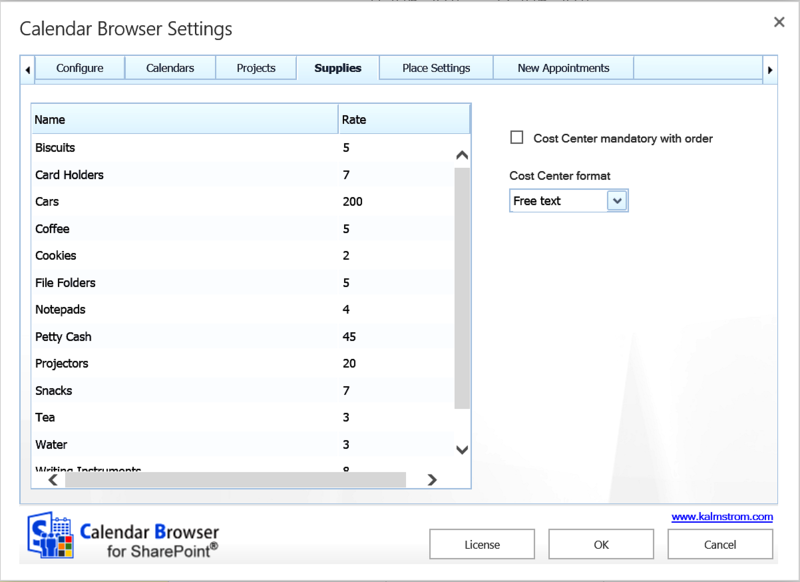 The standard SharePoint calendar views, Day, Week and Month, can be used with Calendar Browser. Resource descriptions can be created. Users only have to click on a button to see a description of the selected resource. Additional services – like catering services, conference material or IT equipment – can be ordered with each booking. The admin enters these items in the Calendar Browser settings. 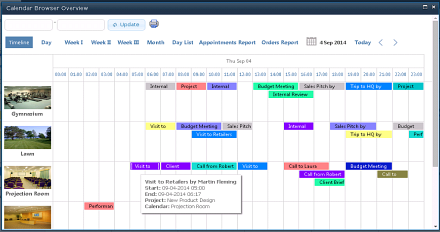 Users may also tie each booking to a color coded project (or a person, unit, customer etc. ), and in the settings you can adapt Calendar Browser to your organization in many ways. The Calendar Browser Overview gives a summary of bookings for the time period you select and various reports on the bookings. You may also book resources directly from the Overview. Calendar Browser is a Sandboxed SharePoint Solution. It should be uploaded to a SharePoint solution gallery and activated there and on each site in the collection where it should be used.